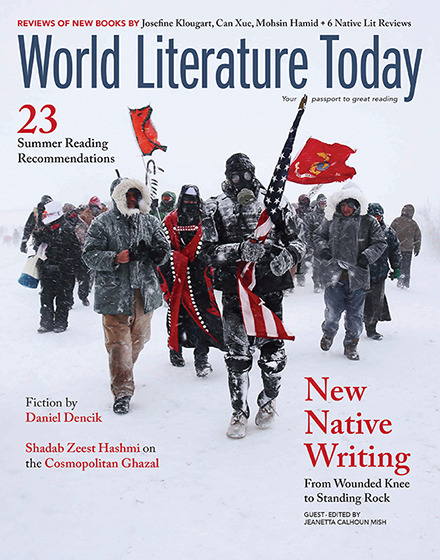 The cover of this issue features the photo “No Spiritual Surrender,” by Alaska Native photographer Zoë Marieh Urness. About the photo, Zoë writes: “On December 5th, 2016, outside Cannon Ball, North Dakota at Oceti Sakowin Camp on the edge of Standing Rock Sioux Reservation, military veterans march in support of the water protectors. As a native photographer from the Tlingit and Cherokee tribes, being able to witness history unfold an array of events only predicated through prophesy has left me Forever Changed and reunited with my cultural roots, like the ones that were instilled in me as a child. Power of prayer and council. Belief in the spiritual workings from ancient times is a weapon that doesn’t need violence to win. History has been made in the unity of us all, spreading healing all around” (December 5, 2016, #1/15, metallic print mounted with plexiglas, 40 x 32 in. ).